A part of the Winning Group, Home Clearance is a clearance outlet that has access to a selected range of premium brand appliances, all at market leading prices that you simply won’t find anywhere else. We believe you shouldn’t always have to pay full price, and so we work hard on finding the best deals but also doing it with the amazing customer service and support that our group is so well known for. We believe that every Australian should be able to furnish their home with quality products. By leveraging our relationships with manufacturers and retailers, we offer a unique range of highly popular products for the home, at market leading prices. These guys may of have been removed from their box but are very handsome appliances, with no physical scratches or marks. If you’re after a brand new product in it’s box but at a heavily reduced price, we have you covered with our range of run out clearance items. When you purchase one of our clearance items, you receive the full standard manufacturers warranty meaning that if something goes wrong within the warranty period, you’re covered just as well as if you purchased the product brand new. In any event anything goes wrong with a product you got from us, just give us a call or send us a Service Call Request and we’ll work with you until your problem is solved. 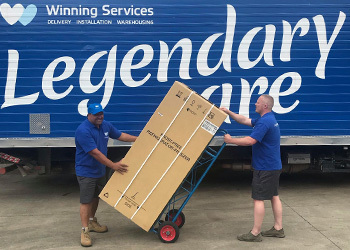 If you have ever bought from Winning Appliances or Appliances Online you will know about the amazing delivery service we provide, because we offer the exact same thing! 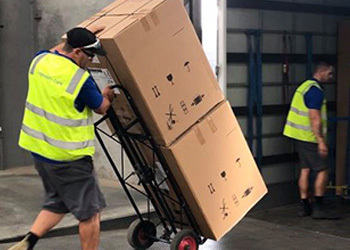 Being apart of the Winning Group, our warehousing and delivery is shared so when you buy with us you get the same amazing delivery service, same friendly drivers, and same free removal of your old product. 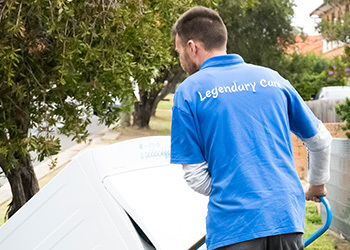 Read more about our amazing delivery service here. Our customers give us feedback in one of two ways. They either leave feedback via our internal feedback tool (we use Net Promotor Score) or they will go and leave feedback on a public review platform such as ProductReview.com.au. We’re not perfect, not every single order or delivery goes to plan but we pride ourselves on our ability to meet and exceed customer expectations, and the feedback we receive on a day to day basis is proof we’re not doing too bad. NPS is a feedback system used by many companies all over the world. By getting customers to rate you post-purchase you’re given a score between the range -100 to +100. Anything above 0 is considered good, +50 is excellent and anything +70 is world class. The average score for retail in Australia is +12. They were so great! Quick, professional and even installed my washing machine for me which I didn't buy from Home Clearance! Will definitely use you guys in the future again! Always a pleasant experience with this company, from online browsing, query over the phone to delivery. Extremely efficient and knowledgeable staff. Bought a repacked fridge of them. It was delivered in 24hrs. The fridge was "like new" but saved me hundreds! The service is amazing: clear communication on delivery times. Txt messages within 2hrs and another within 30mins of delivery. The delivery guys are fantastic: 5th floor (stairs) delivery of a fridge, removal of my old fridge and packaging.